Our church has had two lives. The original church was built in 1855 but a terrible fire burned it down. In 1920 a beautiful stone church was built on Pulis Avenue and as the church grew, a large addition was built. With the new addition, the sanctuary in the stone part of the church became the “old sanctuary” and was used in various capacities over the years including a nursery school and a place for meetings and rentals. But as the years rolled on, the old sanctuary looked kind of lonely. And then last fall a very talented and resourceful committee headed by Pam & Bruce Ford came along and repurposed the old sanctuary into The Old Stone Music & Coffee House. They literally brought the room back to life and now on the first Friday evening of each month folks come to listen to a wonderful selection of local musicians, drink some coffee and enjoy conversation. This summer the saying, “what’s old is new again” proved to be true! 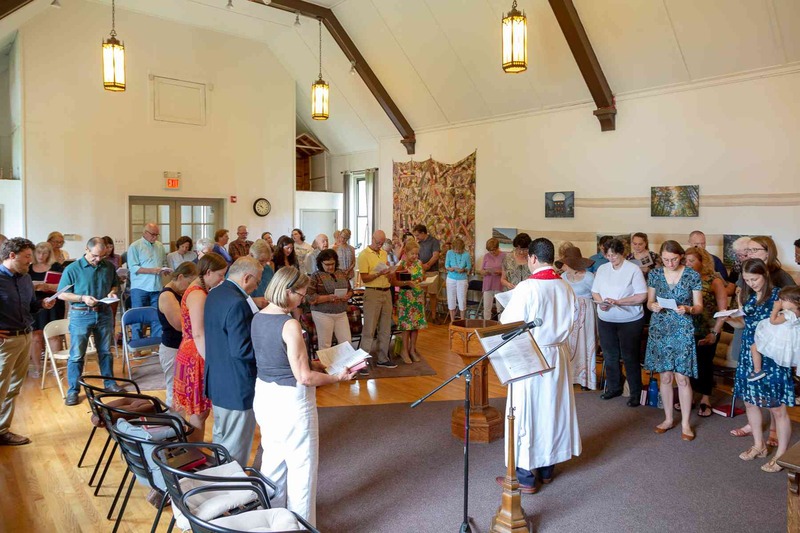 The congregation happily moved into the “new” old sanctuary for the summer months and, as you can see by the photo, enjoyed the warmth of the informal setting for their church services.